Hunger for silence is the sign of spiritual maturity. This saying is attributed to John Paul the Great and reminds me of the program he proposed to the Church after the Great Jubilee of the Year 2000. He called the Church to gaze on the face of Christ. Learning to gaze on the face of Christ takes us into a mystery of great silence - not just the absence of noise, but a peaceful silence of heart that only the Lord himself can produce. The Carmelite mystics explain that it is in Christ's adoring silence that a Lamp of Fire begins to burn within. The Catechism of the Catholic Church #2628 identifies adoration as one of the forms of prayer encompassing an attitude primary to all authentic prayer, an attitude that blends humility and hope in our approach to God. Externally, adoration expresses itself when we kneel down, fold our hands, and close our eyes. But more important than these external gestures that dispose us to adore the Lord is the interior movement of heart, a movement that should inform everything we express in prayer. When we glimpse the incomprehensible transcendance of the Lord, His holiness, over anything and everything else that is, especially over "self", a certain awe grips our hearts and we fall humbly silent before Him. Those who surrender to this awe more and more through their faithfulness to prayer discover a deep yearning for this adoring silence. That is because this silence is not a mere therapeutic experience of non-activity. For the overworked and exhausted, such silence can be very important but it is not the adoring silence of Christian prayer. Rather the silence of adoration is a humble openess to the Lord's super activity, an active receptivity to the overwhelming and unimaginable power of God. Those who embrace the mystery of the vigilant silence have a sense of exaltation in their hearts. They understand the words of Mary, "My spirit exalts in God my savior." When we are moved like this, it is such a personal experience that we are tempted to think we are the only ones who have ever had it. But then we notice others folding their hands and closing their eyes after a powerful homily or during a beautiful hymn. I have seen some people not move for hours, they are so enveloped in this prayer. Others, like the Carthusians, have accepted vocations in which their whole way of life is centered in this prayer. Very few are willing to share the movement of their hearts at these moments. Those who begin to pray soon discover that adoring silence characterizes their conversations with the Lord. Elisabeth of the Trinity, a twenty six year old Carmelite nun, just weeks before her death in 1906, identifies this movement of prayer as an "ecstacy of love" and the "beautiful praise" that is "sung eternally in the bosom of the tranquil Trinity." Ecstacy is not merely an emotional trip but a spiritual journey. The word actually means "to go out from oneself." Elisabeth well understood how adoration rescues us from self-preoccupation. It makes God the center of our hearts. At the same time, it involves us in a search for the face of Christ within us, within those painful places - memories, feelings - we would rather avoid. When we discover the face of Christ gazing on us in love in the midst of our own brokeness - the brokeness has no more power over us. Before Christ, human misery can no longer imprison us within ourselves. We discover real freedom when the Lord leads us out through this misery into the abyss of his mercy. For the Christian, true ecstacy in prayer is like the journey revealed in Psalm 23, "though I walk through the valley of death, I fear not for you are with me." If we consider adoration as a going out of self, we better understand what Elisabeth intends to convey when she attributes adoration to the inner life of the Trinity. In the bosom of the Trinity, that is in the very communion of the Father, Son and Holy Spirit, Elisabeth 'hears' adoration as a song of praise. Notice that her vision of heaven is not something static or boring. I think anyone who actually believes God is like that will never learn to pray. Why should anyone pray if in the end we wind up with something lifeless? In us, there is a passion to thrive the rebels against the temptation of nihilism. Even under the shadow of the certainty of death, we do not want to perish, but to live. This passion was put there by God himself. God is himself the thriving happiness which is the source of all beatitude. He is so filled with life and love that only those with great passion can find Him. And yet He yearns for us to find Him and in Him to realize the perfection of all our noble human potential. We are talking about the total freedom to love - to give oneself to God and others in a communion of unending love. To live like this is completely opposed to anything boring or static. Heaven is a place where nothing inhibits love. And we all know our finest moments in life are precisely those moments when we love without counting the cost, when we give everything for the sake of the beloved - whether a spouse, a child, a stranger or God. These moments of strength, courage and freedom are such gifts. They allow us to glimpse who we really are. Imagine yourself in your finest moment -- only this time the moment never ends. It is with this kind of love the Jesus adores the Father from all eternity -- it has all the force and power of great music, or rather, this is the source of all music. Flowing from the heart of the Trinity, Elisabeth 'hears' a symphony of love in which our own silent adoration somehow participates. Elisabeth understands this graced participation as Christ adoring the Father within us through our faith in Him. Perhaps the most beautiful attempts to express this idea is contained in the writings of St. John of the Cross. Especially in Living Flame, the Spanish mystic describes an intimate experience of God in terms of "Lamps of Fire" (LF 3). Those who fully enter into the prayer of adoration discover that their journey into God has allowed God to journey into them - that is, has allowed God to be present in new ways. The warmth and light of God permeates their every action - this to such an extent their very presence strengthens and enlightens those around them. Elisabeth would say that even in their most weakest and human moments, the Lord's eternal resounds through them. How does silent adoration lead to a life filled with such love? Elisabeth and John of the Cross speak about a humble loving acceptance of persecutions, tribulations, nights, dryness, and other tests. By having the courage to continue to adore in the midst these great trials, joining his song of praise in those crucifying moments of our lives, we learn the secret of gazing on the face of Christ crucified by love. This allows us to be completely surrendered to God, because keeping our eyes fixed on Him, nothing can overwhelm us but His infinite love. And so the reason we come to yearn for adoring silence. When we catch, even for an instant, the look of love in his eyes, that powerful yearning for our happiness, nothing can separate us from Him and his warmth and light in us becomes, even in the most bitter cold darkness, a Lamp of Fire. Tommorrow will be the feast of Catherine of Siena. Check out http://tiny.cc/cpJpt for a little on her history. She is an important figure for those who see a rediscovery of prayer as the force of renewal in the Church. Because she put her devotion to Christ first, she found herself with a spiritual mission to help restore the life and unity of Christ's body. Some of her efforts met with a little success. But as she approached her death at the age of 33, her lifetime of effort in building up the Church seemed to be in vain. Corruption, scandal, cowardice - and most of all indifference - seemed to infect the Church even more. (For more on her life, go to http://www.newadvent.org/cathen/03447a.htm.) Yet she never lost hope and she persevered in prayer. This is because she understood the love and mercy of God. She was uneducated, but in 1377, by a miracle, she learned to write. Even so she retained secretaries to whom she dictated most of her thoughts. Her master work on the spiritual life is known as the Dialogues. These are conversations between her soul and God the Father. God the Father reveals his deep love for his Son and his plan to build up the Church. One of the beautiful aspects of this conversation is the Father's explanation for how each soul can come to know Jesus. The family of God requires a new kind of love, a love which only God can give us. A beautiful foundation is laid for what will later be understood as a "call within a call," that particular mission each one is entrusted with in the eternal loving plan of God. On one hand, answering this call involves some suffering - just as Mother Theresa in our own time discovered. But those who endure this would not have it any other way. There is a certain joy and fullness of life that one discovers when one generously embraces the loving plan of the Father. The possibility of this joyful fulness makes Catherine's message to the Church dynamically attractive. There were two great contentemplative mystics from the 19th Century who continue to have an impact on the way the Church understands prayer and the spiriitual life. Therese of Lisieux and Elizabeth Catez were late 19th century contemporaries and Carmelites. They both plummeted the depths of prayer and reached the heights of sanctity. Their messages, while different, are complementary. This is due not only to their Carmelite spirituality, but also because Elisabeth was among the very first people to read Therese's autobiography, Story of a Soul. Less than a year after the death of Therese, the Carmelites in Dijon shared this edited collection of texts with a local youth minister profoundly gifted with a life of prayer, thinking that it might encourage her own vocation. They could not have known that this work would blow wide open a new vision of prayer and spirituality for the future Elisabeth of the Trinity. To shed light on what Elisabeth grasped in the writings of St. Therese, it is helpful to refer to a letter which in all likelihood Elisabeth never saw. Known as LT 196, Therese wrote to Sr. Marie of the Sacred Heart right around Sept. 13, 1896, trying to provide her with an explanation for her approach to the spiritual life. Therese helped form young women who came to the Carmelite Monastary in Lisieux - a small town west of Paris. To provide formation, she developed a body of teaching she called "The Little Way." Rather than drawing attention to great heroic acts of the faith performed in a way that others might notice, Therese proposed the ideal of spiritual childhood. In this ideal, all the emphasis was on trusting the loving goodness of God, the Father instead of one's own accomplishments in religion and prayer. She considered this a new spiritual invention - not unlike the elevator. Instead of struggling up a stare case of trying to do things to please God, this "Little Way" focused on doing everything out of love for God. It provided a way of living the discipline Christian life through humble acts of love rooted in a prayerful awareness that the Lord was in control - the most important thing would be to trust in his merciful love. Therese of Lisieux went so far as to offer herself to God as an oblation to his merciful love - generously accepting all the graces God yearned to give but no one else would accept. She understood that by doing this, God would make her into an instrument of his love for others. The key insight to understanding her discipline of spiritual childhood, however, does not shed as much light on what someone is expected to do as a child of God as much as it illumines the intensity and extent of Christ's love. A Carmelite once explained to me that the Lord searches for us more than we search for him. This is so true. His heart yearns for to come to him without reserve, with complete trust. How can we be half-hearted when the Lord yearns for us so much? How can we be indifferent? Yet, not our great works, only our wholehearted love appeals to Christ. It is this insight - or rather encounter with the thirsting heart of Christ - which Elisabeth of the Trinity came to share with Therese of the Child Jesus. To search for and accept this encounter seems to be the key to their teachings. A theme that runs through the great christian teachers of the spiritual life is abandonment to the love of God the Father. Our faith tells us that this is the supreme act of love Jesus offers on the Cross. Jesus also directs his disciples to make the same offering when he commands them take up their own cross and follow him. By following the Lord in this, we begin to experience the resurrection. Here I would like to explore this paradox - I ramble abit only because I do not have time to make it more concise - please forgive me. 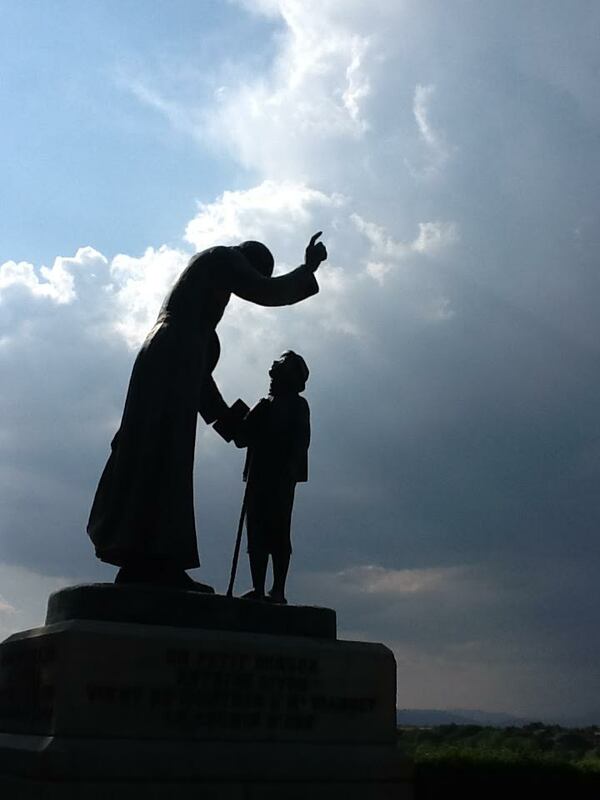 At the end of the 19th Century and the beginning of the 20th Century, two Carmelite mystics have helped shape the way we understand this teaching in our era. Therese of Lisieux and Elisabeth of the Trinity help us understand how to begin to practice this total surrender to the love of God in daily life and prayer. Their lives witness to the fact that this act on our part is something that the Lord will invite us to make at the supreme moment of our lives, and at the same time, it is an act we practice every day. It is a desire of the Christian heart that needs to be fed and strengthened until it bears the fruit of a mature love. The desire to completely surrender to God's love is holy and all holy desires are produced by the Holy Spirit working within us. It is also true that already desiring something is to possess it to some degree. But in the beginning these holy desires are impeded by deep wounds in the heart - and the heart does not have the power to heal itself either from the harm others have caused it nor from the harm it has caused itself. Our hearts are not pure - at least, they do not start out that way. So eventhough we have holy desires, we might desire them with a mix of impure motives and without the courage such the Holy Spirit demands. Since this desire comes from the Holy Spirit, what can we do to help the Holy Spirit purify and strengthen it? The first thing that strengthens a holy desire is to give it expression. Both Therese of Lisieux and Elisabeth of the Trinity are known for prayers centered around an act of complete surrender, total abandonment to the will of the Father. Therese wrote her "Act of Obedience to Merciful Love" in 1895 of which she also provides an explanation for in Manuscript B of her autobiography Story of a Soul. Elisabeth of the Trinity likewise authored a prayer Oh My God, Trinity whom I Adore in 1906. (Another similar prayer authored about the same time is Charles de Foucauld's Act of Abandonment to God the Father or Into your Hands I Commend my Spirit.) When we begin to pray these prayers, we do not always feel like what we are actually doing with our lives correspond with the desires we are trying to express. But I do not think this is very important, at least not in the beginnning. The noble desire to completely surrender to God's love is fragile in the beginning. Praying these prayers is like blowing on sparks to light a fire. Closely associated with giving expression to our holy desires is the cultivation of a humble attitude. Elisabeth calls this simplicity - we must simply learn to rely on the Lord alone and not be distracted by anything that tries to draw us away from him. John of the Cross details a discipline of life in Ascent to Mt. Carmel, Book I, Chptr 13. Key to his counsels is to practice only enjoying those things that are purely for the glory of God and renouncing the enjoyment of anything that does not give God glory. John of the Cross observes that Jesus acted in the same way and that we should imitate him because we love him. In truth, God is in all things, surrounds all things, sustains all things. Things of themselves never distract us from God when we enjoy them for His sake. Our problem is that we tend to entertain ourselves for our own sake rather than for God's. As long as we do this, we are living with disparate desires and to have desires at war with each other within the heart is very exhausting. This is why simplicity of heart is so important. The more simple the heart, the less the interior conflict, the greater our strength for the Lord. If we seek him in simplicity of heart, we will find him and have the strength to enjoy his presence. God is also at work in us to strengthen and purify our desire to completely surrender to him. John of the Cross describes the dark contemplation where God seems absent in prayer as one of the most vital ways God is at work in us. When God seems absent in prayer it is like suffering from a spiritual poverty and a naked vulnerability twoards suffering. It is a very uncomfortable experience to endure. But when we persevere in being present to God when he does not seem present to us the Lord is able to transform our involuntary and unconscious motivations. Those who endure begin to experience an abiding peace in their spiritual life. Before this dark night of prayer, we seek the Lord in a sort of anxious way - just like someone who in dating is trying too hard to find his spouse. Such anxiety does not instill confidence. But God looks passed this weakness because He always sees the love of which someone capable - and our love enchants Him. He yearns for the soul that begins to move towards Him and his desire is for that soul to thrive. Even when He seems to withdraw his presence for a little while, His purpose is always for a greater union, in this case one characterized not by anxiety, but by peace. To be relatively free of mixed involuntary motives like anxiety is a great grace. To live a peaceful spiritual life of walking with the Lord is worth anything trial that one must endure. But the Lord is not satisfied with a peaceful desire. He wants a joyful desire. And to accomplish this, he must allow us to suffer even greater and more intense spiritual trials. These are never the punishment of an angry God but always the careful remedy of the Divine Physician. He yearns for us to be whole - which means to ceaselessly desire to love, peacefully and with joy. Until now, our desire for abandonment into the merciful love of the Father has freed us from sin and from the involuntary inclinations to sin. Here our desire for abandonment has matured. But though we have matured in our holy desires, there are still deep abysses of the heart that rebel against the love of the Lord, that prevent us from abandoning ourselves completely. This is where John of the Cross explains there are still first movements of the soul. Original sin deeply wounded the first movements of our soul so that they are not disposed to God. This fundamental movement is such that only sheer grace can heal and restore it so that our souls become as innocent as those of Adam and Eve. Here, God begins to heal even that which causes our unconscious motivations. The very depths of our misery, the rejection of God that lives within us and is our hell, is embraced by the Lord. Free to offer God this misery, we discover his abiding joy - a love that is stronger than death, that can overcome even our deepest resistance to him. Thus, insofar as our desire for abandonment disposes us to these experiences of the Dark Night, it helps to cause the night. As this same desire is purified through these difficult trials, a more perfect desire for abandoning ourselves into the hands of our merciful Father is also a fruit. When the soul becomes perfect (in this life it is always a relative state of perfection), it is finally free to abandon itself in such wise that it becomes a complete and holy sacrifice of love to the Lord. In the Oblation to Divine Mercy, Therese is celebrating this fruit. The heights of Christian mysticism do not culminate in being removed from messy humanity but being submerged in it with Christ. Nothing holds it back from completely trusting the Father and wholeheartedly doing everything for love of Him that his merciful love might be known. Such a soul fully realizes what it means to be an instrument of divine mercy for others. It is free to receive all the graces rejected by others and to become a conduit through which these gifts of love flow into the world, even into those places where the Lord is most absent. This is what John of the Cross describes in Spiritual Canticle where he says that such souls become springs of living water for others. By desiring to be a spring for others, we already are to some extent. Yet it is of the very perfection of the Christian life to become a spring for others in a more perfect way - without anxiety, in peacefulness, and in joy. And today, so many thirst for peace and joy. All of this is the experience of the great saints that everyone points to. But this path from glory to glory - from desire to peace to joy - is experienced as a smooth transition. It is lesser known that the mystics also testify to this more difficult and more human reality. All along the way, no matter how much we strive to edify others and love them as Christ has loved us, we know that this is not enough. We see what lies ahead, what the Lord really desires for us but it seems impossible. Elisabeth acknowleges in the face of such noble aspirations we become curiously aware of our weaknesses and deficiencies. For some this awareness is so great they are tempted to discouragement. She, however, turns to the Lord even more, begging him to achieve through her what she cannot possibly achieve by herself. Elisabeth's prayer is rooted in an insight from her older Sister in the Spirit, Therese. Therese in the midst of the same trial would think about the goodness of God in relation to her holy desires to give everything to him, to be completely surrendered to his love. She reckoned that God's goodness and her desires must collide and she wanted to know how. Why would God fill her with such noble desires if He did not have a plan to realize them? Yes, God would realize her desires in his own time and by his own power. She understood that her job was to trust him, to believe in love, to love unto the point of folly, just as He did not the Cross for those whom he loved. In this, a path was opened to her and she discovered a new way to draw her strength from the Lord. She would persevere in love, waiting for Him to lift her up. She called this kind of surrender, a surrendering to the Lord as his prey. The image she used was that of a little bird yearning to fly to the sun without the wings to do so. How could God allow her, like that little bird, to suffer such great desires if he did not intend to satisfy them in another way? Christ would come like a great Eagle and lift her on high just like an Eagle might carry a small bird in its pinions. Her job was to wait on the Lord and to trust in his power. To him, would be all the glory for any good that she might do. Her insight is rooted in a profound teaching on the Holy Spirit and the nature of Christian hope. The Holy Spirit lifts us up To surrender ourselves as his prey, to abandon ourselves to him as our Father – these are the same movements of heart produced by the Spirit of God that raise Jesus from the dead. God in his merciful love will raise us up to realize the perfection of these holy desires in us - the realization of the holy desires of our hearts, this is the beginning of our own resurrection. I was recently asked about the relationship of the experience of the dark night in the spiritual life and growth in compassion. For some of my readers, this will seem a little esoteric. But the dark night really is not. The dark night refers to difficult spiritual experiences, especially in prayer. Most Christians experience this for greater or lesser lengths of time with both greater and lesser intensity. They are difficult to endure, especially if they last for a long time. They are also necessary for spiritual growth. Because the temptation is to abandon one's faith during these periods of darkness, Catholic mystics and doctors through the centuries have developed special teachings aimed at encouragement. One of these is St. John of the Cross who develops his theology of "the night" throughout his poetry and in his commentaries: Ascent to Mt. Carmel and Dark Night of the Soul. Spiritual darkness often involves backsliding, sliding back into sin. In every case, the confusion brought on by this kind of darkness is addressed by returning to the Lord through prayer and a converted life. But this is not the only kind of darkness Christians must endure. There is also darkness related not so much to sin itself as much to the wounds and imperfections sin causes. If these things are not addressed, our ability to love God and one another is impaired. So God in his mercy begins to heal us in this life - even when the medicine involves suffering what seems to be his absence or at least the absence of his consoling presence. He really is never absent but it feels like absence and even rejection. What is actually unfolding is a much deeper encounter with the Lord, deeper than our affections can feel or our intellect can know. It seems like darkness because we do not understand or feel what God is doing - but his power is at work accomplishing much more than we can ask or imagine. John of the Cross speaks of two different kinds of night in this regard -- the night of the senses and the night of the spirit. The night of the senses refers to the purifying work by which God heals the effects of sin on our five senses and our imagination. This night has two phases - active which involves taking up the discipline of the Christian life for the healing of our conscious level of existence and passive which involves a kind of contemplation by which the Lord heals unconscious levels of our existence. The night of the Spirit has these same two phases only that the passive phase is much more intense and heals the depths of the human heart which the term 'unconscious' does not quite capture. This article refers to both the night of the senses and the night of the spirit. St. John of the Cross does not spend a lot of time describing the compassion of heart that develops in the Dark Night of the Senses because his focus is on progress towards the perfection of the Christian life in terms of union with God. But there are indications that in his thinking the soul that passes through this night, especially the passive phase of it, does become profoundly compassionate. One might say that compassion of heart is a fruit of this night. One good places to explore this is in Dark Night book 1. Here he treats of 7 spiritual imperfections of beginners. He assumes that these beginners have already taken up all the difficult work of renunciation explained in Ascent to Mt. Carmel, book 1, Chapter 13. They are already in the active phase of the dark night – their lives have already begun to be hidden in God. But the Lord wants to hide them even more. These beginners are no longer inclined to comforts and satisfaction on a voluntary level. By renouncing everything that is not for the glory of God, they have come to a certain kind of freedom in the spiritual life. They are free from earthly things more or less. This means that merely material things no longer provide an obstacle to obeying the will of God as it is revealed through a superior or through interior promptings. But there is another level at which they are not free – there are still involuntary inclinations and attachments in their hearts which no amount of asceticism can purify. Only God can do this through the passive phase of the Dark Night. St. John of the Cross does not describe this exactly but these seven spiritual imperfections are all obstacles to compassion. For example, spiritual pride involves putting one’s identity in the ability to master the Christian discipline of life instead of the Lord alone. As a result, those suffering from this are always comparing themselves with others and always desiring that others think highly of them. They do not do this willfully (not most of the time), but involuntarily. Thus, they are not moved to compassion but judgment in the face of the suffering or weakness of others. Similarly with spiritual anger – in which one is involuntarily filled with righteous indignation over the faults of others, or imperfections in the liturgy, or pastoral mistakes. Likewise, spiritual acedia-sloth in which an unconscious sluggishness constantly gnaws at someone when they try to enter into the heart of someone who suffers – and at the same time they find themselves deeply disturbed when someone else gladly goes ahead of them to show love where they themselves failed in courage – spiritual envy. To drive this home, I need to refer to my own experience and I am sorry that it is so insipid, but it will serve to illustrate the point. It is an unconscious movement that I often catch myself in. Whereas before I set my identity in being the best at intellectual or athletic or social achievement, these things are not as important to me because I have renounced them for love of Jesus who died for me. If I am faithful to the discipline of the Christian life in terms of prayer, asceticism and works of mercy, these things no longer have the power to attract me away from the Lord. So I have a more spiritual object for my desires – serving the Lord. But the desire with which I desire this more worthy object is still quite broken. I desire to serve the Lord not for his own sake, but for my sake, my ego. And this I do even though I do not want to and know that it is imperfect. There is so much to this – a lack of trust in God’s loving plan, an idol of perfection that God has never willed, fear of completely surrendering to God and letting him show me the path to perfection, fear of myself. As long as I do not accept who I really am before the Lord even if involuntarily, how can I possibly be compassionate to another? I cannot accept others and share their misery with them if I lack the courage to face my own misery and accept the truth about myself before God. Yet the kicker is that I do not consciously will this state of affairs – it is simply the way things are, the way I am. St. Bernard sees this as a very imperfect way to be. My compassion for Jesus is held back because my love is merely mercenary. I have not learned to love God for his own sake - how can I love others for their own sake? He teaches that only special mystical graces can raise me above this kind of love so that I learn to love God, not for my own sake, but for his sake alone. How do I dispose myself to this new kind of love, a love not polluted by unconscious movements that hold it back from God and through God to others? To progress to a better love, St. John of the Cross says I need to pass through the passive phase of the dark night of the spirit. He calls this a ray of darkness, a certain spiritual nakedness, in which I have no satisfaction in observing the discipline of the Christian life. In prayer, it will seem as if God were completely absent, as if he were ignoring me. And isn’t this just what I need for a little while? On an involuntary level, I think I am so impressive to God and everyone else – I will continue to think that I am the absolute center of the universe until I suffer a sort of Copernican revolution. Such a revolution Until I am stripped of this, I cannot see that God is the true centre and until I see even on an involuntary way that God is the true center, I cannot have compassion – that is, because of my unconscious egoism, I am trapped in my heart and unable to suffer the feelings of God who mourns for his people in their misery and who rejoices when they taste his love for them. I am also unable to suffer the misery of all those God has entrusted to me. Caught up in myself, I am impeded from seeking the hidden presence of the Lord calling out to me in my children and my wife and my colleagues – and even in my enemies. To free me from myself, God in his tremendous love will hide himself more deeply within me than I have ever gone or can ever go with my own efforts alone. Here, I am like the bride in the Spiritual Canticle, who awakened by her beloved just as he runs off into hiding. She must find him – and the more she seeks him the freer she is of herself. She experiences a certain Copernican revolution in this journey towards her beloved. All of a sudden, she realizes that she is not the center of the universe anymore than the earth is the center of the cosmos. Because her love for Him becomes greater as she searches for him, mysteriously she comes to see herself for who she really is – as the one who needs her Beloved. Just as the earth revolves around the sun, she discovers that the real truth about herself is that she revolves around Him, and Him alone. As she sees this truth about herself through this night, she is finally able to be compassionate towards others. She knows the truth about who they really are in the eyes of the Lord – true compassion is able to speak this truth by suffering the misery of the other so as to affirm their dignity. Compassion is part of mercy by which we suffer the defect or evil or misery of another to affirm their dignity. On a natural level aided by grace empathetic people can do this to some degree. But even they are limited by their own short comings from being able to do this in a transforming way. The other person remains trapped in his own misery even if he knows he is not suffering it alone. In order to really be merciful, we must be prompted by the Holy Spirit. Through his gift of counsel, he shows us the secret sorrows that our neighbors bear, that they struggle with in isolation. They feel like no one else knows their suffering. But God does and the Holy Spirit yearns for us to be an instrument through which the Lord might reveal his merciful love. As long as involuntary imperfections, like lack of self-knowledge, block the movement of the Holy Spirit in our heart – even though he shows us, we cannot see. But as the ray of darkness penetrates our depths and as we realize that God alone is our deepest center, we begin to understand what the His Spirit reveals to us and we find the courage to enter into the heart of another. Under his impetus and by his power, even our weakest attempts at empathy and compassion are transforming. It is at this point that one of the most powerful realities of the communion of saints is realized. The unconscious imperfections are purified and healed, but they do not go away exactly. Instead, they are transformed. My egoism does not magically disappear when I realize that I am not at the center of the universe. Nor, when I am prompted by the Holy Spirit to enter the heart of another, is the effort ever easy. But when I prayerfully recognize the gravity of my big fat ego holding me back from loving someone God has entrusted to me, rather than blocking me, my otherwise destructive self-love becomes an occasion of grace which causes me to turn to the Lord with greater trust in Him. It simply requires a simple movement of the will, an act of trust, a persevering belief in the faithfulness of God. This loving movement informs my efforts with an invincible hope, even when my efforts appear completely futile. My poverty is filled with the riches of God's grace in such moments. His power is made perfect in our weakness if we persevere and believe in his love even when continuing to love seems impossible. The “blasphemy” that “strikes” her heart is not merely something she sees in the “weight of sin” that sinners suffer. She experiences this in her own heart. Rather than leading her to sin, however – we see this description where it leads her to praise. We can compare her song which blots out this sin with the mystical grades of prayer described by Teresa of Avila – where one is so filled with God’s presence he can’t contain himself and wants to shout out praises. But this prayer, beyond what St. Teresa describes, actually helps others (beyond herself) as St. Therese explains “return to grace and bless [God’s] Name.” As St. Paul would say, it is in her weakness that the strength of God is brought to perfection. In other words, God wants to transform the involuntary weaknesses we suffer into doors that lead into his heart and the hearts of others. He can only do this by the dark night first of the senses (where it begins) and then of the spirit (where it is brought to perfection). So for anyone suffering through the nights, the great Catholic mystics encourage you to hang on and not lose hope. Trust in the Lord and persevere in the Christian life - God is doing immeasurably more than we can ask or imagine. John Paul II had an enormous impact on my own spiritual journey and today marks the 4th anniversary of his death. This picture is from my friend James Baca of the Denver Catholic Register. 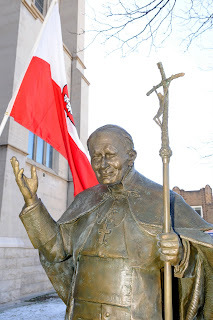 It is a statue outside the Cathedral in Denver - where the pope visited in '93. My parish, Good Shepherd (and the surrounding neighborhood), helped host about 5,000 of the c. 300,000 people who particpated in World Youth Day. The Holy Father told us to be bold in proclaiming the Gospel of Christ - "Shout it from the rooftops ... of the modern metropolis"
I like to reflect on his apostolic zeal and special concern for young people. I especially love his teaching. Some of Pope John Paul II's most powerful theological insights included his vision of mercy. Mercy, he explains, is love that suffers the brokeness of another so as to affirm that person's dignity. This idea is beautifully explored in his encyclical on Mercy (http://www.vatican.va/edocs/ENG0215/__P9.HTM). Here is the Son of God, who in His resurrection experienced in a radical way mercy shown to Himself, that is to say the love of the Father which is more powerful than death. And it is also the same Christ, the Son of God, who at the end of His messianic mission - and, in a certain sense, even beyond the end - reveals Himself as the inexhaustible source of mercy, of the same love that, in a subsequent perspective of the history of salvation in the Church, is to be everlastingly confirmed as more powerful than sin. The paschal Christ is the definitive incarnation of mercy, its living sign in salvation history and in eschatology. In the same spirit, the liturgy of Eastertide places on our lips the words of the Psalm: Misericordias Domini in aeternum cantabo.100 "